AJ Lacey designed several churches for the Norwich Diocese in the early years of the 20th Century, and this is the best of them, I think. And yet, it seems little known. We are, in fact, not far from the centre of Norwich, and a ten minute walk from St Benedict's Street and then off the Dereham Road will bring you here to find it snuggled amongst a sea of low-rise post-war flats. This was the infill between the historic village of Heigham and the centre of the city which became built up during the middle years of the 19th century, but it was all comprehensively redeveloped when this part of Norwich suffered the worst of the German bombing in the last days of April 1942. St Barnabas is very reminiscent of Lacey's almost exactly contemporary church on the other side of the city centre at St Mary Magdalen, Silver Road, but it has suffered fewer alterations, and was in any case the more impressive building. This is hard to see now, although the west front is still allowed to face on to a small courtyard, and as at St Mary Magdalen there are twin doors flanking the baptistery under a castellated frontage creating a rather gothick effect. The west window tracery above is more beautiful here than at the other church. The aisles appear smaller than they are, with large Perpendicular-style windows to east and west. The dedication stone was laid in the name of the Father and of the Son and of the Holy Ghost by Mrs Sheepshanks on St Barnabas Day 1903, a suggestion of High Churchmanship which survives at St Barnabas to this day. I came here on a Thursday morning in July 2009. It was the start of the summer holidays, and I was pottering around Norwich in a pleasingly aimless kind of way. I'd wanted to come to St Barnabas for some time, having seen photographs of the glass inside, and it was with some excitement that I found the church open. I stepped inside to a dim interior infused with colour from the glass. The mid-week parish Eucharist was taking place in the north aisle. I am not an Anglican myself, but I know the service well enough, and it was a pleasure to sit on the cool pedestal of the font and listen to those gentle words which go back so far. A brass plaque beside my head commemorated the high water mark of the great Norwich flood of 1912. There were about twenty people in the congregation, nice to see on a Thursday morning, and another reminder that the death of the Church of England has been greatly exaggerated. The service finished, and I said hello to the Priest. She was very friendly, as were the churchwardens, and the other members of the congregation. I think I must have shaken hands with nearly all of them. What a lovely bunch of people. They were very pleased that someone was interested in their church, particularly as they did not get many visitors on the last Heritage Open Day. Perhaps my photographs would help attract more interest? I said I would see what I could do. St Barnabas has the effect of seeming much larger inside than it appears from outside, and this is partly because of the way the steps climb into the chancel, with the great east window beyond. This contains what is probably the best Kempe window in Norwich, and there is more Kempe glass in the east window of the north aisle. But best of all, I liked all the post-war glass, the work of the Essex-based artist Alfred Wilkinson. It starts in 1947, with the Presentation in the Temple in the five-light baptistery window. The High Priest holds the infant Christ: to the left, Mary holds the two doves, with Joseph holding lilies behind her. To the right, Simeon and Anna hold the scrolls of the Nunc Dimmitis. It is a solemn moment, caught with gravitas, and perhaps it is not fanciful to read into it the gathering of thoughts in this part of war-torn Norwich at the time. By the 1950s, however, there was a lightening of heart, and in the north and south aisles are further Wilkinson windows. Perhaps the best-known is that in the north aisle, a thank-offering from friends of this church for blessings received during its first fifty years 1906-1956. A spectacular Christ welcomes the children into his arms, while on one side are a Scout and a Cub, on the other a Brownie and a Guide. Across the church, a Blessed Virgin and Child are flanked by St Paul and St Barnabas, while to the west the Risen Christ is flanked by scenes from Bethany: to the west, Christ is greeted by Mary and Martha, while to the east is the later raising of Lazarus. The Wilkinson windows have such a bright and joyful spirit that they make the Kempe windows seem more ponderous than they really are. The great east window, an expanse of glass of cathedralesque proportions, depicts the Risen Christ flanked by censing angels and angel musicians, while below his feet are four large figures of St Michael, St Martin, St Nicholas and St George, with Gethsemane and Calvary flanking the central scene of the the three Marys finding the stone rolled back and the tomb empty. I think that, in Norfolk, only the Kempe window at Horstead is more impressive. The glass in the north aisle east window depicts a rather crowded Nativity, and is less good. 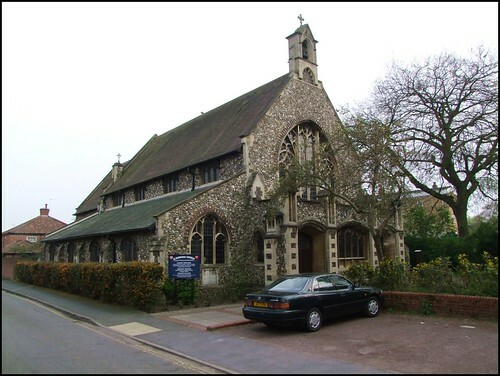 At the time of its construction, St Barnabas was one of several Heigham Anglican churches. But the medieval church of St Bartholomew was destroyed in the Blitz, and St Philip on Heigham Road was demolished in the 1960s. It is a blessing that this beautiful little church has survived, not least because it houses the grand Heigham war memorial, set in an alcove in the north aisle. Benches have been arranged to create a quiet space, the Turkey carpet a reminder perhaps of how many of the Norfolk Regiment lost their lives at Gallipoli. All in all, this is a super church, with a sense of continuity and community, a living witness in the crowded streets of inner Heigham for more than a century now. It really does deserve to be better known.